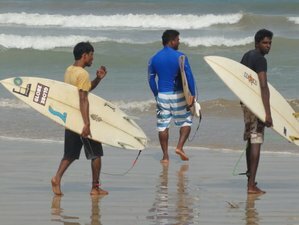 Join Sundance Surfcamp on a wonderful surfing experience in Sri Lanka! Located right in the epicenter of 10 surf spots for all surfing levels within four-kilometer distance in either direction, the venue is perfect for a day filled with attempts to conquer the wave. Here, you can take the lessons with a professional surf instructor and continue to practice by yourself with the provided surfboard in this program. A great opportunity to perfect your technique and just enjoy the ocean! Sundance Surfcamp offers five newly built comfortable and spacious double rooms with bathrooms in a relaxing cosmopolitan ambiance. Staff manager speaks, English, German, Spanish, and Portuguese fluently and understands French, Italian, and Dutch. Sundance Surfcamp will take a look at how you fare in the water if you have had prior experience surfing. In most cases, beginners need longboards, but there are also people who already took a surf lesson in another country, but still belong to the beginner's section. According to the daily surfing conditions, you will be taken to the best nearby surf spots for beginners or advanced surfers. After taking your surf lesson, you have the choice to take a break and / or keep on practicing by yourself. As you keep your preferred surfboard all day long, Sundance Surfcamp will drop or pick you up at any chosen time one more time in the afternoon for practicing on your own. You will not depend on anybody else's service nor hire another surfboard; it is all included. Beginners will get recommended the right surfboard according to their body size. This is important because as a beginner, you might need a different surfboard after checking your feeling for balance and physical condition to paddle. These lessons will be conducted in safe “white water” conditions. A brief introduction of the right stretching exercises is part of this first step as well. You have to know which muscle groups are the most important and vulnerable for beginners. Sundance Surfcamp does not like to teach more than two beginners at the same time as it might be noticed in other surf camps, because they want to get the best out of you the quickest way. Furthermore, beginners have the possibility to improve their sensorimotor feedback for balance by means of a special device in the garden. Sundance Surfcamp invented the funny name “the magic hedgehog exercise” for this. You should bring out UV protecting T-shirts for surfers from your home countries to avoid painful sunburns. In Asia, you find lots of copies anywhere, which might not have sufficient quality. You should also bring out sun cream with the highest protection factor. A video recording will be made especially when noticing that most common mistakes will be repeated several times. Visualization can help tremendously to speed up your learning process. Another common mistake is that ambitious beginners want to change to “green water” level too quickly and fail. Kasun Maduranga is a very experienced teacher and will decide when it is best for you to go there. Once progressing we will get you to the right soft “green water” spots as we have the best variety of nearby options. Starting this transition process, beginners have to be prepared to get up pretty early in the mornings to take their lesson. As surfing gets very popular all over the world you should not mix up with many more advanced surfers like yourself at the same time or spot, because accidents can happen, when it gets too crowded. You have to respect skills of others. Always have a look who is in front or starting behind you, especially when practicing alone later on in the day, whatever surfing level you have. When surfing later than 10 am you might have days when it gets too windy to find the right waves for you. Better start practicing again at 4.30 pm. This is not a general rule but we do not have an influence on daily surfing conditions in green water even though this is a surf paradise for beginners. As a general rule for beginners, please do not cross places where people get lessons by other local surf teachers when practicing on your own later on in the day. You also can decide by yourself or discover what suits you best, riding a wave to the right or left. Sundance Surfcamp will teach you some turning point techniques as well. Another objective is to help you to achieve the longest ride getting out of a wave, avoid nose-diving in case waves are breaking quickly and steep, realize where to paddle next and recognize the right wave to catch. On some days you might even have to change your surfboard adapting to different conditions, switching to a longboard again when waves have not enough power. Kasun Maduranga is one of the best local surfers and is your surf teacher for this program. Surrounded by golden beaches, excellent warm water, and surfing conditions, Sri Lanka has become popular among surfers from all over the world in recent years. Sundance Surfcamp is located right in the epicenter of 10 surf spots for all surfing levels within four-kilometer distance in either direction. The best surf spots of the country are just 250 meters away from the surf camp. The village is one of the top places in the world for surfers looking for a variety of options. Choosing Sundance Surfcamp, you have it all within a couple of minutes distance including excellent guaranteed everyday waves. It is the location that can help you make any decision much easier. When booking a surf package with Sundance Surfcamp, this includes one excellent fish barbecue or vegetarian dinner in our restaurant or garden. The restaurant also offers wood-fired pizza and fish barbecues or smoked fish for everybody (evenings). Apart from this, only in-house guests (surf packages) have an exclusive choice in between 30 different ayurvedic vegan, vegetarian, seafood or meat dishes for dinner on request late mornings same day. This is the only way to ensure clients to get really fresh and healthy food in tropical areas like Sri Lanka because we will have to buy according to daily seasonal market conditions as we know local markets very well. Sundance Surfcamp offers affordable yoga classes on their large sunset terrace. Sundance Surfcamp is a Sri Lankan owned enterprise located in the picturesque, remote fishing village of Gurubebila, southwest of the island. Sundance Surf main season package is available from October till May. Early bookers can select a first-floor room with excellent views and a sunset terrace if available. Base floor rooms have a garden view. Sundance Surfcamp needs to prepare the rooms for follow up guest. In case of no follow-up guest, their leaving guests can relax some more time in their room without cost. On the other hand, new guests can check in earlier when arriving early or at night if the room is not occupied. Thinking about staying short or long term? Please inquire for more information.